Introducing my Granlee Garden Focal series in memory of my grandmother, Lois. 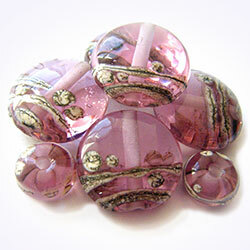 I have lots of handmade lampwork beads for sale in my Etsy shop. 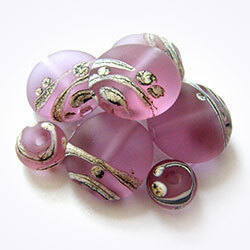 Including plenty of made to order glass bead goodies. Don't have an Etsy account? Sign up, it's free and easy to use! To etch or not to etch? That is the question! Welcome to by keiara! 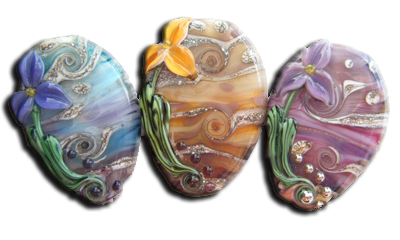 Home to handmade lampwork beads. Individually created in the flame by me, Keiara Wells at my studio in Kent on the south coast of England. From elegant florals and tree landscapes to pretty kitties, whimsical cupcakes and gothic zombies, by keiara offers something special for your personal style. Feel free to browse galleries of my handmade glass beads, read a bit about me and contact me for information about custom orders. Please use the menu at the left to explore my world of sparkly treasures.